If Filipinos were here first, shouldn’t this be the United States of the Philippines? 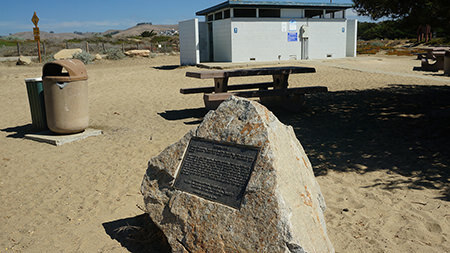 This year, I made a pilgrimage to a special landmark that you may miss unless you happen to be looking for the only public restroom at a particular vista point in Morro Bay, California. For Filipinos, maybe even for all Asian Americans, maybe it should be considered our mecca. Or perhaps our blarney stone to kiss in order to receive that gift of history. Morro Bay is the place where the first Asians landed on what would become the most Asian American part of the nation. Now I’ve been to Plymouth Rock in Massachusetts before, and I must say this is much more exciting. 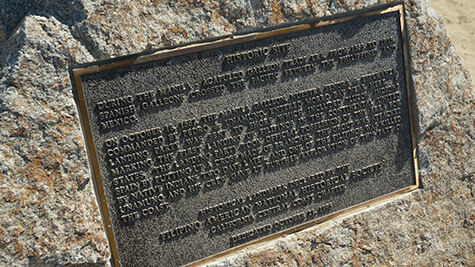 In Morro Bay, a special rock marks the original landing of Filipinos to America on Oct. 18, 1587, some 33 years before the Pilgrims landed. And yet, we still make such a fuss about those Mayflower folks with their big hats and buckles, as if that’s something to be thankful for. And those First Filipinos? Well, as usual, it’s still the same old story, a theme modern-day Asian Americans are surely familiar with. Filipinos may not have had the power, but first is first. Technically, they were the hired help, the shiphands of Pedro De Unamuno, who sailed for Spain, as he landed on Morro Bay, close to San Luis Obispo on the Central Coast of California. While Unamuno, not a Filipino, is only partially obscured in history as one of those “have-boat-will-travel” New World explorers, the Filipino parts of the story are almost totally obscured. The turning point in all this has been the original research of Unamuno’s logs published in UCLA’s Amerasia Journal in 1996 by Eloisa Gomez Borah, a librarian and a trustee of FANHS. She makes the case for a Filipino presence, telling the story of how Unamuno was part of a Spanish expedition led by Francisco Gali in 1584. When Gali died, Unamuno lost command of the two ships he inherited after taking a side trip to Macao. Stranded in Asia, Unamuno was finally able to buy another boat, described by Borah as a “theirsingle-deck three-masted vessel” named Nuestra Senora de Buena Esperanza. And the deckhands were mostly from the Philippines. On July 12, 1587, Unamuno headed for points east and was at sea until the end of his voyage on November 22, 1587 in Acapulco, Mexico. But there was a brief three-day land excursion between October 18-20 that turned out to be their foray onto California’s central coast. Unamuno sailed with the Franciscan Father Martin Ignacio de Loyola, nephew of the founder of the Jesuit order, a few priests, and soldiers. 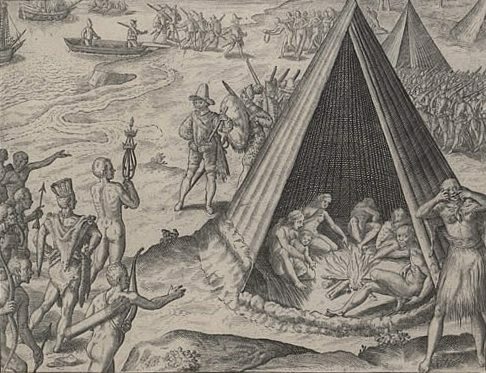 The logs also reveal the presence of at least eight Filipinos identified as “Yndios Luzones,” or Luzon Indians from the northern Philippines island of Luzon. They were jacks-of-all-trade seamen, seen as the brawny manpower of the ship. In an email exchange, Borah told me too often they were left off the logs. Borah counted “Yndios” appearing in the logs 42 times total. In 23 times, it was a reference to the native Californians encountered, but 19 times it described the crew. But they mattered on Sunday, October 18. That’s when Unamuno, after anchoring off the California coast in a place he called Puerto San Lucas, formed a landing party. 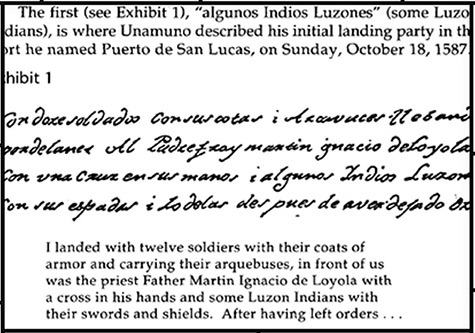 It was 12 armed soldiers led by Father Martin Ignacio de Loyola, cross in hand. But even before the cross, up ahead of them all were two Filipinos armed with swords and shields. It was their typical formation. But note: The Filipinos were first. Being fodder comes with some privilege. On day one, the expedition climbed two hills, saw no settlements or people, and took possession of the land for the King of Spain. On the second day, October 19, eight Filipino scouts led a priest and 12 soldiers for further exploration. It was on the third day, October 20 that the expedition encountered violence. But not before there was an effort from the ship’s barber and some Filipinos to make a peace offering of food and clothing. Maybe they needed clothes, a meal, and a haircut? Borah said it was fine until the Indians tried to kidnap the barber, and that’s when a violent exchange ensued. The log noted one soldier was killed, but so was one unnamed Filipino, by a javelin, his blood spilled on American soil. Unamuno didn’t stay long. He left by daybreak on October 21 for Acapulco. The significance of three days? Borah calls it the unique evidence of a Filipino presence that is too often obscured when historians fail to identify or differentiate among non-Europeans in their crew. When I contacted her last year (when I wrote my original piece on Unamuno for this blog), she was adamant. Borah was referring to a much discredited story that suggests China discovered America before Columbus. So it’s interesting that Filipinos are still forgotten, unremarked upon, and ignored, even as they exist as nearly a quarter of the more than 20 million Asian Americans today. And yet of all the Asian Americans, Filipinos were here first. They even spilled blood, yet left empty-handed after three October days in California, 1587. That’s why the Filipino American National Historical Society is championing the cause. And why not? Columbus was in the West Indies, not on t he continent. Unamuno and the Filipinos were before the Pilgrims, before Jamestown. But most of us know of the Nina, the Pinta and the Santa Maria, the boats of Columbus, the Italian who sailed for Spain and landed somewhere other than America. And come November, we fuss over the Pilgrims and their Mayflower. But Unamuno’s Our Lady of Good Hope, loaded with Filipino crewmen? How many of us know this fine point of history? It deserves to be much more than a footnote, if not a bank holiday, don’t you think? And we might as well have an October feast day as well. Halloween isn’t quite that. (We’ll hold off on a parade for now). The quick fix. Get thee to Brooklyn’s Purple Yam, or DC’s Bad Saint, or wherever fine Filipino foods are served (for vegetarians, pig optional). Thank the Filipinos for not making a bigger stink about it all. Let us savor history and celebrate with a big Filipino meal in honor of the first Filipinos to America, 430 years ago, October 18, 1587. After all, first is first. The Amok Monologues, written and performed by Emil Guillermo, comes on Oct. 18 to UOP Stockton, 7pm, Wendell Phillips Center Room 140. The free presentation is sponsored by College of the Pacific. See it on the East Coast at Baltimore’s Charm City Fringe Festival in November.